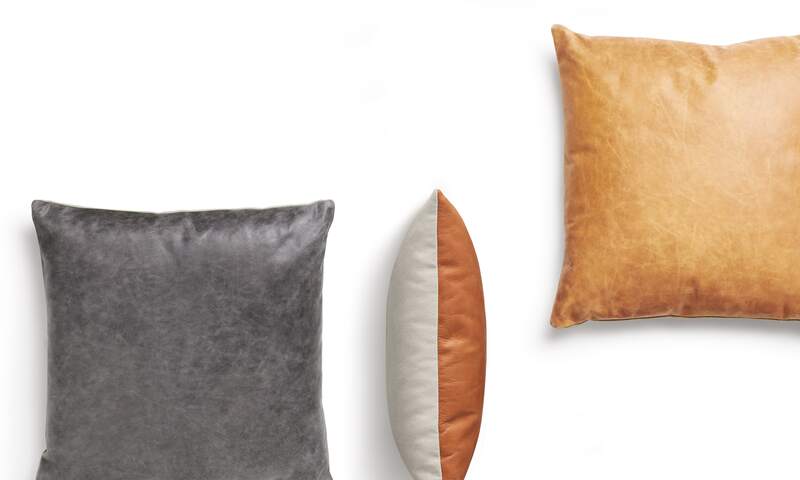 Fiber and feather fill pillows get a two-tone treatment of contrasting fabric and leather that play nicely together to enliven and soften sofas, lounge chairs, beds or even the floor. Also available in a 20" square pillow. • Camel / Slate Leather: An aniline leather that has been burnished and polished to create a cool hand and velvety texture with a slight sheen, enhancing the natural character of the leather; A lovely patina will develop over time. • Terracotta Leather: An aniline leather with a soft matte finish and velvety feel; Variation in the natural leather becomes more beautiful with use.